Meet My New Puppy Eloise! Okay, so I did get a new puppy. 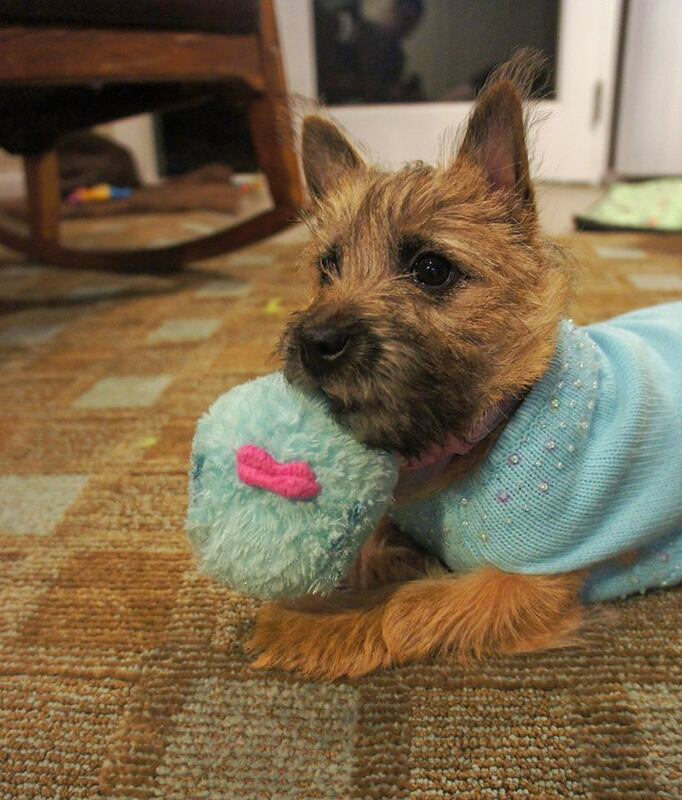 Weezy is a Cairn Terrier, and almost 5 months old now. She looks very sweet, and has a keen fashion sense, (especially color-coordinating her stylish ensembles with her accessories, aka toys,) but don’t let the face fool you. Little Hannah Lecter will bite your nose off, if given the chance, which is why she started obedience training on Saturday. But that wasn’t the new baby I was referring to. Last week we launched the new Smart Perks website with a bright, bold design, fun new features, and, of course, what Smart Perks is all about, great money-saving offers on merchandise and services. I don’t know if you’ve ever launched a website before, but months of planning goes into it. And not just the fun stuff, like making color choices, developing logos, artwork, and fun features; such as games, weather-bugs, and weekly merchandise deals. There are also wire-frames to be created (don’t ask,) and seemingly endless discussions of navigation to make the site user-friendly and intuitive, so that ultimately site visitors can get to the deals that much faster. The whole Smart Perks team got together and brainstormed content ideas, like the featured tips from experts, on everything from electronics to home improvement, decorating and organization, whatever we thought our Smart Perks audience could use to make their lives easier, using less of their precious resources – time and money, and help them work smarter, not harder, so they can simply relax and enjoy the good life! After that came the coding, coding, and more coding from our brilliant tech team. And testing. Weeks of testing on every browser and mobile device we could get our hands on. Finally the day came last week with much fanfare and a mostly pain-free labor, as we launched our new baby out into the world. We’re proud of the new SmartPerks website, our Facebook page, Twitter feed, Pinterest boards, and this blog. Our team consists of creative, passionate people with a wide variety of interests, hobbies, and talents, and we want to share them with you. We want you to look forward to more posts like the ones you’ve seen so far, including what we hope will be helpful information, tutorials, and inspiration. Maybe even some tips on training your new puppy – Miss Weezy has provided lots of hands-on experience. So I hope you’ll stop by the new SmartPerks website, say “Welcome to the World, Baby,” and take a look at what we have to offer. There are over 35 new offers in the Spring Smart Perks mailer. If you’ve never received a Smart Perks mailing, visit the new site and sign up. 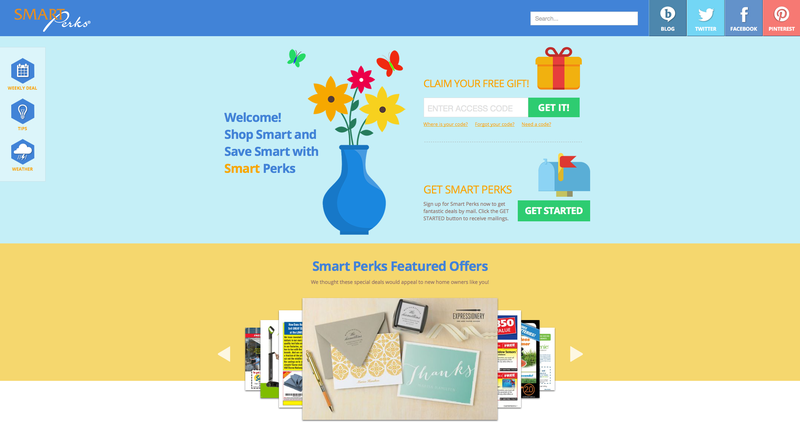 There’s also a great offer for a free $25 gift card, when you receive your first free Smart Perks mailing. Smartperks.com – see you there! When she’s not blogging for Smart Perks, Melanie is staring glassy-eyed at Pinterest, her Pin It finger splinted from overuse. Besides crafting, gardening, shopping and cupcakes, the loves of her life are her three naughty terrier pups, the smartest and best-looking dogs in the world, and her husband.